The best-selling single malt whisky. Whisky, or whiskey, is an alcoholic drink distilled from grain and aged in wooden casks. The name comes from a gaelic word. In Ireland, it is called whiskey, with an added letter 'e'. Whiskey made in the United States often uses the Irish spelling. Single malt: All of the whisky has been made from single batch of malt in one single distillery. They have been matured in oak barrels, usually 6 to 24 years. Glenfiddich is the world's best-selling single malt whisky. It comes from Speyside in the Scottish Highlands, and accounts for 35% of world sales. The Glenlivet comes second, from the same area. Thus, despite all attempts at competition, this small area near the Spey River still dominates the world market for single malt whisky. Other well-known single malts are Laphroaig, Lagavulin, Bowmore, Ardbeg and Talisker. Most single malts come from Scotland, either Lowlands, Highlands or Scottish Isles. Nikka Yoichi comes from Japan. Blended whisky or Scotch: A Scotch is a mixture of various single malts. This is the most common type of whisky. Famous blended whiskys are Johnnie Walker, Chivas Regal, Ballantines, J&B, The Famous Grouse and Vat-69. 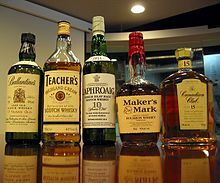 In the United States the word "scotch" refers to the blended whiskys of Scotland. Blenders do not distill whisky, but mix various single malts. Irish whiskey: These are blended whiskeys from Ireland. While Scottish whiskys are distilled twice, Irish whiskeys are distilled three times before they are matured. Famous Irish whiskeys are Jameson's and Bushmill's. Bourbon whiskey: Bourbon is American whiskey which contains maize. It may all be made from maize (corn whiskey) or it may also contain barley malt. Famous bourbons are Four Roses, Jim Beam and Kentucky Gentleman. The name comes from Bourbon county, Kentucky. Most whiskys contain around 40% alcohol. Scotch whisky is legally defined by Scotch Whisky Order of 1990 (UK), and the Scotch Whisky Act of 1988,. ↑ "The Scotch Whisky Order 1990". Office of Public Sector Information. Retrieved 2006-12-22. ↑ "Scotch Whisky Act 1988 (c. 22)". Office of Public Sector Information. Retrieved 2006-12-22. This page was last changed on 31 December 2018, at 17:05.